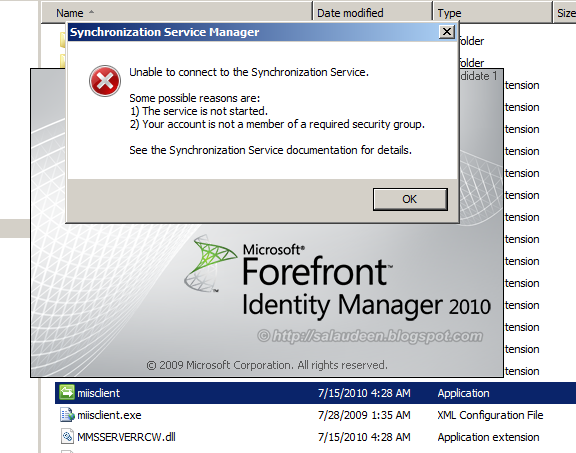 While configuring User Profile Synchronization in SharePoint 2010, User Profile Synchronization service got stuck at "Starting" state. User profile synchronization service was in starting state for long time! I've been banging my head for couple of Hours. Verified the environment has latest service pack - SP1 installed. While configuring SharePoint, I used SQL Alias. As UPS doesn't like SQL Server FQDN or IP addresses! I made sure the Farm Account has "DB Creator" and "Security Admin" Roles. Verified Forefront Identity Manager Synchronization Service and the Forefront Identity Manager Service are running in the identity of the account which as Farm Administrator access rights. The account in which I logged on and trying to configure user profile service application has local administrator rights on the farm, But not Farm Administrator account, My Fault! user profile synchronization service account should have Farm Administrator access. After a while, tried running the FIM client from: C:\Program Files\Microsoft Office Servers\14.0\Synchronization Service\UIShell\miisclient.exe , FIM gave an Error Message: Unable to connect to the synchronization Service. found the root cause of the issue! Solution was: The account I currently logged-in is a Local Administrator account, but not SharePoint Farm Admin! Logged off and logged in with Farm Admin account. Tried stopping the service which was in "Starting" state. How to stop the User Profile Synchronization service which got stuck at "Starting" state? In some cases, user profile synchronization service may started and then stopped. But here, user profile synchronization service hangs! Lets seek help from our friend: PowerShell! Get the User profile Synchronization service's GUID and pass it to Stop-SPServiceInstace cmdlet. This will get all the services along with their GUID to a text file, say "services.txt". Open the file and get the GUID of User profile Synchronization service which will be in Provisioning state. Now, again tried starting the user profile sync service (Application Management >> Manage services on server >> Start "User Profile Synchronization Service"), waited for 5 - 10 minutes, Boom! it worked this time! In an another case, when we tried re-creating the user profile service application, had the same issue. 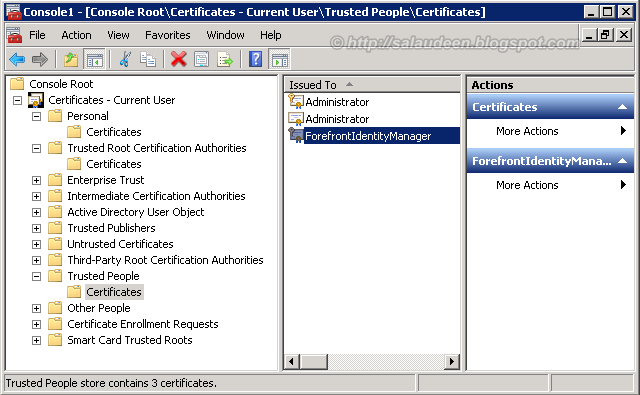 Fix for this issue was to Remove ForefrontIdentityManager certificates from these 3 locations. This is because, when I deleted an existing user profile service, it didn't delete the certificates and when recreating it caused the issue! Open a MMC Console and add the Certificates Snap Inn.